Hiras is committed to the ideals of precise craftsmanship with excellent tailor made suits & shirts. Our professional custom tailoring remains one of the best in the business of bespoke tailoring. Our trained fitters are available to provide you with expert advice regarding the right fabric, design, and style for your garments. With our bespoke suits, the wearer gives off a distinguished appeal that is incomparable to wearing off the rack types. The hand crafted and special detailing of the suit makes it unique to the wearer. The numerous fittings and quality control involved in the bespoke tailoring process enables the suit to last for many years. 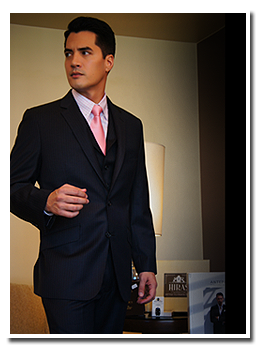 With our excellent and dependable custom tailoring service, we take extra care of all our clients. We recognize each request warrants immediate care and attention. In recognition of the trust bestowed on us, we provide bespoke suit & shirts packages and special privileges to our clients.